Keeping a journal at work can be your secret weapon against missed meetings, details, or bad performance reviews. Whether you are an employee or self-employed, you can improve your productivity and performance at work by keeping a journal. I have maintained personal and professional journals for past 5+ years and in this post I want to share the work journal template. In my previous article, I shared a more general daily journal template and this article I will share a work specific one. I will also share what I’ve learned about successfully keeping a work journal. Capture: A place to capture work related information – meeting notes, deadlines, action items, important information, and countless other bits of information that are best stored on a paper instead of your brain. Articulate: A place where you can articulate the information. For example, sketching out a diagram to understand what is being explained to you. Self-Reflect and Growth: This is the most critical part of keeping a successful journal for work. Your ability to self-reflect and learn from your experiences will constantly improve your skill and productivity at work. In summary, a work journal is like a storage drive which allows you to capture, process, and articulate information with the help of your brain. Therefore, your brain does the job of thinking while the journal (with the help of your hands) does the job of a permanent hard drive. Now that we understand what makes a good template for work journal, let me jump into the specifics of a work journal template. I write this part early in the morning (before the hustle bustle of work) so that I can keep my focus on the big picture. I consider this section essential as it allows you to appreciate the small things in your life. This is where you write out your goals at work. These should be planned and written at the start of the day so you can make progress towards them by the end of the day. This is where you write down work that comes up. For example, your boss wants you to run a quick errand or your co-worker needs help. Your goal should be to finish and record these activities as fast as possible so you can go back to your Outcome-Based Goals (Part 2) – the work you planned to get done. Throughout the day things may pop-up in your head that you may want to personally get done. For example, grab bread on the way back home or read a book. This section is focused about your personal growth and should be an essential part of your work journal. Sometimes the goal or task at hand has many sub-tasks and that is when I use a sticky to write it out and track my progress towards it. This is the section where I remind myself what personal growth experiment I am focused on for this day, week, or month. For example, in the above journal entry, I was (and still am) focused on “essential-ism focus” – a fancy way to say to focus on one thing and one thing only. That sums up the breakdown of my work journal. 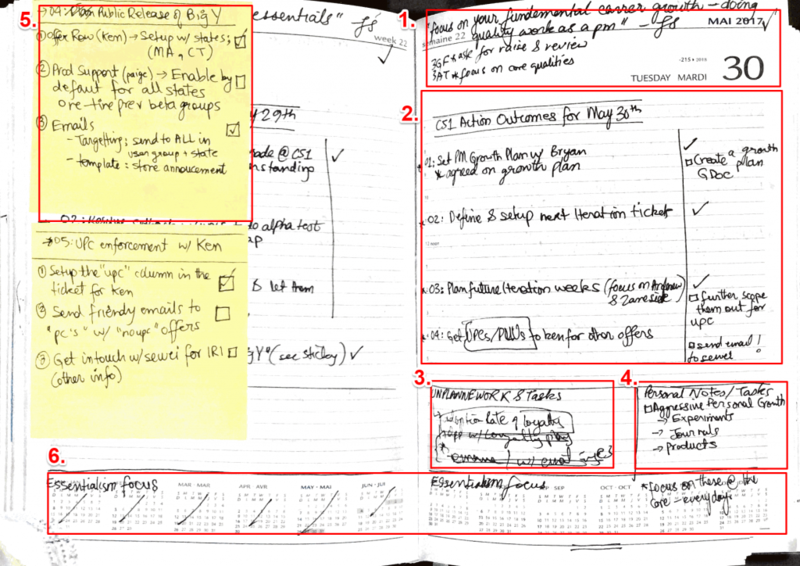 In addition to my journal, I still use digital task management app (i-e Trello). In future posts (or upon request), I hope to expand on how to use your physical journal and a digital task management app side-by-side to get more work done. If you want more detailed guide to write each of the above parts, please subscribe to my email list and I will send you resources and video guides.